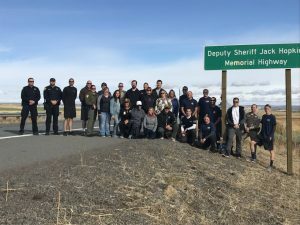 ALTURAS, Calif. – A memorial run was held to honor a fallen Modoc County Sheriff’s deputy. In October 2016, Deputy Jack Hopkins responded to a family disturbance call. When he arrived at the scene, he was fatally shot. The suspect went on to engage in a shootout with Sheriff Mike Poindexter, but he was eventually arrested. On August 16, 2018, the Modoc County Sheriff’s Office said Cal-Trans placed “Deputy Jack Hopkins Memorial Highway” signs on U.S. Highway 395 south of Alturas. On Wednesday, law enforcement officers in Modoc County gathered for a run in memory of Deputy Hopkins. The group ran and walked the 3.8 miles between the signs for Hopkins on the highway. They plan on doing another run next year.